« Babies vs. 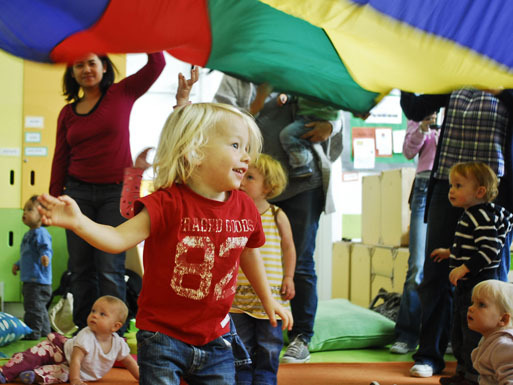 Toddlers: Which is the Right Group for My Child? We’ve been running birthday parties for tots for nearly 5 years now, and I’ve picked up a few good ideas to make sure things run smoothly. I think it’s nice to mark a child’s first birthday in some way – you made it through the first year! A family tea party is a nice idea with a couple of friends from a post-natal group. You can sing some songs and let the children play with a few toys. However, some families like to make it a bigger event and invite a few more people, either to their home or to a hired space. With young children (1–2 years old) you don’t want too much structured entertainment because they have a limited concentration span. I would say 30 to 45 minutes is plenty, and it should be geared to the age of the birthday child. No point in having a magic show or a disco for a 1-year-old and his friends! If you go to a regular dance, music or gym class with your baby then you can always ask the class leader if they would come and do a special session to celebrate your child’s birthday. For a Movers and Shakers party, we find out your child’s favourite songs or characters and build a party theme around them. For example, if a child’s favourite song is Old Macdonald, but she also loves Peppa Pig, then we might bring a big cuddly Peppa Pig to the party, and then go to Old Macdonald’s farm with her and meet all her friends: Baa Baa Black Sheep, Horsey Horsey and the Five Little Piggies! We also understand that children this age want to join in rather than just watch and listen, so we make sure every child has their own instrument to shake and bang along in time with the songs. We also play parachute games and have lots of fun popping bubbles. At this age parents need to support their children and help them join in the fun. And then after half an hour or so, the children will be ready for some food, or a bit of free play with some toys. This is a great chance for the adults to socialise and chat. If you know that there are lots of grown-ups at the party who won’t want to join in the children’s entertainment, it might be a great idea to have them in a separate room. I sometimes hear back from party leaders that they were worried the children weren’t able to hear their singing because there was so much background noise from the adults! It can be hard to ask everyone to keep quiet, but our party leaders do it very politely (and ask permission from the party organiser first!) as we want to make sure the birthday boy or girl has the best party ever. Another thing to avoid, particularly with slightly older children, is having lots of food and balloons everywhere. Children of 2 or 3 years old are easily distracted, no matter how wonderful the entertainment is, so my advice would be to hide the food and balloons away and then get them out when required. If anyone has any top tips for parties for 1–3 year olds then please leave a comment below.